The best garden is a place where each flower has a distinct personality and contributes to the overall beauty, yet is not overshadowed by the other plants and flowers. If any plant does not have enough water, sunlight, or attention from its gardener, it will not blossom to its full potential and has no ability to add value to the garden. The same is true for each member of your company’s team. Does your workplace culture cultivate your team’s ability to recognize and implement their purpose? Provide a workplace environment that is nurturing to all members. Creating a nurturing environment and addressing racial, ethnic, and other cultural issues will lead to more productive team members, better opportunities, and positive outcomes for job seekers. Let's Hustle and Schedule that Next Training and Professional Development Event. As the face of America continues to evolve, you can quickly observe that it’s time to pursue the cultivation of a more culturally competent organization. During this phase, many ERG leaders and HR managers will eagerly begin to plan professional development training events that drive purpose and sustain the company’s culture. However, the ground must be tilled before those seeds can be planted. First, let’s premeditate on key elements that must be secured before leaping into a training strategy. Making the commitment to become a more culturally competent workforce development organization is often the easy part of the process. 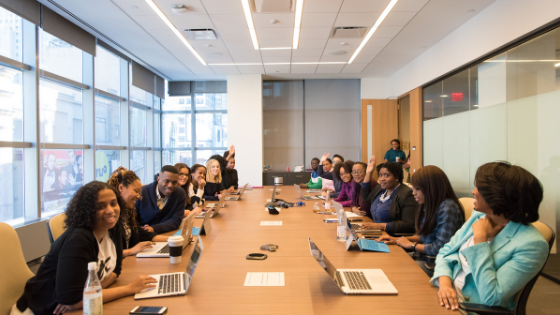 In order to ensure that your organization, clients, and team members can benefit from this process, there are several factors that you should consider before engaging in diversity training and skills building. A visible commitment from the Executive Director/ President of your company is advantageous since they are likely the one person that will determine whether skills-based diversity and purpose-centric training are successful in the development of your culturally-competent staff. Appropriate times to discuss issues throughout the company. Don’t forget that executive commitment is also reflected in the expenditure of resources to contract with a trained consultant, public speaker procurement, purchasing reading materials, diversity toolkits, and guides for your company. Pulling the Weeds. Providing a Nurturing Environment Where 'Voice' is Valued. Recognize that the foundation of every company is its culture. From the very beginning of developing a culture-competent company, staff must be influenced towards positive leadership while having a voice to buy into the strategy. It is important to identify desired outcomes with staff, which in return, will help you identify potential leaders and diversity “champions” on your staff who can facilitate the process with others in your organization. Team members and staff need to have a voice. If staff feel that they do not have any input in the training design, it will be highly unlikely that the training will be effective. What can your organization do to optimize the growth of your purpose-centric culture? 1. Design and present the training yourself. Use ERG leaders, experts, and public speakers to teach and train. 2. Hire a diversity trainer/consultant to provide training. 3. Use a Train-the-Trainer approach to develop and implement a diversity training which is led by selected staff members (such as ERG members). 4. Integrate diversity training into your current staff/management training modules. Positive reinforcement of the buy-in process. Build employee loyalty and leadership skills.Refresh business vitality and drive revenue results. Provide Time for Purpose-centric Development: Let the Nutrients Soak in! After your organization’s training and assessments are completed, give staff time to reflect on what they have learned and what gaps have appeared that they are willing to work on. It is important that everyone in the organization develops an individual, team, and organizational work plan. Plans should have clear goals, objectives, and activities; disseminated to all those involved. Visible Growth Begins! Empower New ERG Leaders as Your Gardeners. During your training or assessment stage, key staff members will emerge as leaders. These are your gardeners who are now equipped to leverage and optimize the purpose-centric value of other team members. Enlist these individuals in the formation of a small group that can represent all levels of the organization and works collaboratively to develop and advance the purpose-centric culture. Your ERGs can now serve as a great outreach tool for your board members, other staff who are not interested in the process, and job seekers who may have questions about whether your organization can address their racial, cultural or gender issues.